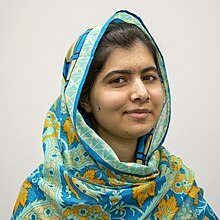 Malala Yousafzai (Malālah Yūsafzay: Urdu: ملالہ یوسفزئی‎; Pashto: ملاله یوسفزۍ‎ [məˈlaːlə jusəf ˈzəj]; born 12 July 1997) is a Pakistani activist for female education and the youngest Nobel Prize laureate. She is known for human rights advocacy, especially the education of women and children in her native Swat Valley in Khyber Pakhtunkhwa, northwest Pakistan, where the local Taliban had at times banned girls from attending school. Her advocacy has grown into an international movement, and according to former Pakistani Prime Minister Shahid Khaqan Abbasi, she has become "the most prominent citizen" of the country. On 9 October 2012, while on a bus in the Swat District, after taking an exam, Yousafzai and two other girls were shot by a Taliban gunman in an assassination attempt in retaliation for her activism; the gunman fled the scene. Yousafzai was hit in the head with a bullet and remained unconscious and in critical condition at the Rawalpindi Institute of Cardiology, but her condition later improved enough for her to be transferred to the Queen Elizabeth Hospital in Birmingham, UK. The attempt on her life sparked an international outpouring of support for Yousafzai. Deutsche Welle reported in January 2013 that Yousafzai may have become "the most famous teenager in the world". Weeks after the attempted murder, a group of fifty leading Muslim clerics in Pakistan issued a fatwā against those who tried to kill her. The Taliban was internationally denounced by governments, human rights organizations and feminist groups. Taliban officials responded to condemnation by further denouncing Yousafzai, indicating plans for a possible second assassination attempt, which was justified as a religious obligation. Their statements resulted in further international condemnation. Following her recovery, Yousafzai became a prominent activist for the right to education. Based in Birmingham, she founded the Malala Fund, a non-profit organisation, and in 2013 co-authored I Am Malala, an international best seller. In 2012, she was the recipient of Pakistan's first National Youth Peace Prize and the 2013 Sakharov Prize. In 2014, she was the co-recipient of the 2014 Nobel Peace Prize, along with Kailash Satyarthi of India. Aged 17 at the time, she was the youngest-ever Nobel Prize laureate. In 2015, Yousafzai was a subject of the Oscar-shortlisted documentary He Named Me Malala. The 2013, 2014 and 2015 issues of Time magazine featured her as one of the most influential people globally. In 2017, she was awarded honorary Canadian citizenship and became the youngest person to address the House of Commons of Canada. Yousafzai attended Edgbaston High School from 2013 to 2017, and is currently studying for a bachelor's degree in Philosophy, Politics and Economics at Lady Margaret Hall, Oxford. Yousafzai was born on 12 July 1997 in the Swat District of Pakistan's northwestern Khyber Pakhtunkhwa province, into a lower-middle-class family. She is the daughter of Ziauddin Yousafzai and Tor Pekai Yousafzai. Her family is Sunni Muslim of Pashtun ethnicity. The family did not have enough money for a hospital birth and as a result, Yousafzai was born at home with the help of neighbours. She was given her first name Malala (meaning "grief-stricken") after Malalai of Maiwand, a famous Pashtun poet and warrior woman from southern Afghanistan. Her last name, Yousafzai, is that of a large Pashtun tribal confederation that is predominant in Pakistan's Swat Valley, where she grew up. At her house in Mingora, she lived with her two younger brothers, Khushal and Atal, her parents, Ziauddin and Toor Pekai, and two pet chickens. Fluent in Pashto, Urdu and English, Yousafzai was educated mostly by her father, Ziauddin Yousafzai, who is a poet, school owner, and an educational activist himself, running a chain of private schools known as the Khushal Public School. In an interview, Yousafzai once stated that she aspired to become a doctor, though later her father encouraged her to become a politician instead. Ziauddin referred to his daughter as something entirely special, allowing her to stay up at night and talk about politics after her two brothers had been sent to bed. Inspired by Muhammad Ali Jinnah and Prime Minister Benazir Bhutto, Yousafzai started speaking about education rights as early as September 2008, when her father took her to Peshawar to speak at the local press club. "How dare the Taliban take away my basic right to education?" Yousafzai asked her audience in a speech covered by newspapers and television channels throughout the region. In 2009, Yousafzai began as a trainee and then a peer educator in the Institute for War and Peace Reporting's Open Minds Pakistan youth programme, which worked in schools in the region to help young people engage in constructive discussion on social issues through the tools of journalism, public debate and dialogue. In late 2008, Aamer Ahmed Khan of the BBC Urdu website and his colleagues came up with a novel way of covering the Taliban's growing influence in Swat. They decided to ask a schoolgirl to blog anonymously about her life there. Their correspondent in Peshawar, Abdul Hai Kakar, had been in touch with a local school teacher, Ziauddin Yousafzai, but could not find any students willing to do so, as it was considered too dangerous by their families. Finally, Yousafzai suggested his own daughter, 11-year-old Malala. At the time, Taliban militants led by Maulana Fazlullah were taking over the Swat Valley, banning television, music, girls' education, and women from going shopping. Bodies of beheaded policemen were being displayed in town squares. At first, a girl named Aisha from her father's school agreed to write a diary, but then the girl's parents stopped her from doing it because they feared Taliban reprisals. The only alternative was Yousafzai, four years younger than the original volunteer, and in seventh grade at the time. Editors at the BBC unanimously agreed. On 3 January 2009, Yousafzai's first entry was posted to the BBC Urdu blog. She would hand-write notes and then pass them on to a reporter who would scan and e-mail them. The blog records Yousafzai's thoughts during the First Battle of Swat, as military operations take place, fewer girls show up to school, and finally, her school shuts down. On 15 February, gunshots could be heard in the streets of Mingora, but Yousafzai's father reassured her, saying: "Don't be scared – this is firing for peace." Her father had read in the newspaper that the government and the militants were going to sign a peace deal the next day. Later that night, when the Taliban announced the peace deal on their FM Radio studio, another round of stronger firing started outside. Yousafzai spoke out against the Taliban on the national current affairs show Capital Talk on 18 February. Three days later, local Taliban leader Maulana Fazlulla announced on his FM radio station that he was lifting the ban on women's education, and girls would be allowed to attend school until exams were held on 17 March, but they had to wear burqas. After the BBC diary ended, Yousafzai and her father were approached by New York Times reporter Adam B. Ellick about filming a documentary. In May, the Pakistani Army moved into the region to regain control during the Second Battle of Swat. Mingora was evacuated and Yousafzai's family was displaced and separated. Her father went to Peshawar to protest and lobby for support, while she was sent into the countryside to live with relatives. "I'm really bored because I have no books to read," Yousafzai is filmed saying in the documentary. By early July, refugee camps were filled to capacity. The prime minister made a long-awaited announcement saying that it was safe to return to the Swat Valley. The Pakistani military had pushed the Taliban out of the cities and into the countryside. Yousafzai's family reunited, and on 24 July 2009 they headed home. They made one stop first – to meet with a group of other grassroots activists that had been invited to see United States President Barack Obama's special representative to Afghanistan and Pakistan, Richard Holbrooke. Yousafzai pleaded with Holbrooke to intervene in the situation, saying, "Respected ambassador, if you can help us in our education, so please help us." When her family finally did return home, they found it had not been damaged, and her school had sustained only light damage. Following the documentary, Yousafzai was interviewed on the national Pashto-language station AVT Khyber, the Urdu-language Daily Aaj, and Canada's Toronto Star. She made a second appearance on Capital Talk on 19 August 2009. Her BBC blogging identity was being revealed in articles by December 2009. She also began appearing on television to publicly advocate for female education. From 2009 to 2010 she was the chair of the District Child Assembly of the Khpal Kor Foundation through 2009 and 2010. In 2011 Yousafzai trained with local girls' empowerment organisation, Aware Girls, run by Gulalai Ismail whose training includes advice on women's rights and empowerment to peacefully oppose radicalisation through education. In October 2011, Archbishop Desmond Tutu, a South African activist, nominated Yousafzai for the International Children's Peace Prize of the Dutch international children's advocacy group KidsRights Foundation. She was the first Pakistani girl to be nominated for the award. The announcement said, "Malala dared to stand up for herself and other girls and used national and international media to let the world know girls should also have the right to go to school." The award was won by Michaela Mycroft of South Africa. Her public profile rose even further when she was awarded Pakistan's first National Youth Peace Prize two months later in December. On 19 December 2011, Prime Minister Yousaf Raza Gillani awarded her the National Peace Award for Youth. At the proceedings in her honour, Yousafzai stated that she was not a member of any political party, but hoped to found a national party of her own to promote education. The prime minister directed the authorities to set up an IT campus in the Swat Degree College for Women at Yousafzai's request, and a secondary school was renamed in her honour. By 2012, Yousafzai was planning to organise the Malala Education Foundation, which would help poor girls go to school. On 9 October 2012, a Taliban gunman shot Yousafzai as she rode home on a bus after taking an exam in Pakistan's Swat Valley. Yousafzai was 15 years old at the time. According to reports, a masked gunman shouted: "Which one of you is Malala? Speak up, otherwise I will shoot you all." Upon being identified, Yousafzai was shot with one bullet, which travelled 18 inches from the side of her left eye, through her neck and landed in her shoulder. Two other girls were also wounded in the shooting: Kainat Riaz and Shazia Ramzan, both of whom were stable enough following the shooting, to speak to reporters and provide details of the attack. After the shooting, Yousafzai was airlifted to a military hospital in Peshawar, where doctors were forced to begin operating after swelling developed in the left portion of her brain, which had been damaged by the bullet when it passed through her head. After a five-hour operation, doctors successfully removed the bullet, which had lodged in her shoulder near her spinal cord. The day following the attack, doctors performed a decompressive craniectomy, in which part of her skull was removed to allow room for swelling. On 11 October 2012, a panel of Pakistani and British doctors decided to move Yousafzai to the Armed Forces Institute of Cardiology in Rawalpindi. Mumtaz Khan, a doctor, said that she had a 70% chance of survival. Interior Minister Rehman Malik said that Yousafzai would be moved to Germany, where she could receive the best medical treatment, as soon as she was stable enough to travel. A team of doctors would travel with her, and the government would bear the cost of her treatment. Doctors reduced Yousafzai's sedation on 13 October, and she moved all four limbs. Offers to treat Yousafzai came from around the world. On 15 October, Yousafzai travelled to the United Kingdom for further treatment, approved by both her doctors and family. Her plane landed in Birmingham, England where she was treated at the Queen Elizabeth Hospital, one of the specialties of this hospital being the treatment of military personnel injured in conflict. According to media reports at the time, the UK Government stated that "[t]he Pakistani government is paying all transport, migration, medical, accommodation and subsistence costs for Malala and her party." Yousafzai had come out of her coma by 17 October 2012, was responding well to treatment, and was said to have a good chance of fully recovering without any brain damage. Later updates on 20 and 21 October stated that she was stable, but was still battling an infection. By 8 November, she was photographed sitting up in bed. On 11 November, Yousafzai underwent surgery for eight and a half hours, in order to repair her facial nerve. On 3 January 2013, Yousafzai was discharged from the hospital to continue her rehabilitation at her family's temporary home in the West Midlands, where she had weekly physiotherapy. She underwent a five-hour long operation on 2 February to reconstruct her skull and restore her hearing with a cochlear implant, after which she was reported to be in stable condition. Yousafzai wrote in July 2014 that her facial nerve had recovered up to 96%. The murder attempt received worldwide media coverage and produced an outpouring of sympathy and anger. Protests against the shooting were held in several Pakistani cities the day after the attack, and over 2 million people signed the Right to Education campaign's petition, which led to ratification of the first Right to Education Bill in Pakistan. [verification needed] Pakistani officials offered a 10 million rupee (US$105,000) reward for information leading to the arrest of the attackers. Responding to concerns about his safety, Yousafzai's father said: "We wouldn't leave our country if my daughter survives or not. We have an ideology that advocates peace. The Taliban cannot stop all independent voices through the force of bullets." Pakistan's president Asif Ali Zardari described the shooting as an attack on "civilized people". UN Secretary-General Ban Ki-moon called it a "heinous and cowardly act". United States President Barack Obama found the attack "reprehensible, disgusting and tragic", while Secretary of State Hillary Clinton said Yousafzai had been "very brave in standing up for the rights of girls" and that the attackers had been "threatened by that kind of empowerment". British Foreign Secretary William Hague called the shooting "barbaric" and that it had "shocked Pakistan and the world". American singer Madonna dedicated her song "Human Nature" to Yousafzai at a concert in Los Angeles the day of the attack, as well had a temporary Malala tattoo on her back. American actress Angelina Jolie wrote an article about explaining the event to her children and answering questions like "Why did those men think they needed to kill Malala?" Jolie later donated $200,000 to the Malala Fund for girls' education. Former First Lady of the United States Laura Bush wrote an op-ed piece in The Washington Post in which she compared Yousafzai to Holocaust diarist Anne Frank. Indian director Amjad Khan announced that he would be making a biographical film based on Yousafzai. Ehsanullah Ehsan, chief spokesman for the Pakistani Taliban, claimed responsibility for the attack, saying that Yousafzai "is the symbol of the infidels and obscenity", adding that if she survived, the group would target her again. In the days following the attack, the Taliban reiterated its justification, saying Yousafzai had been brainwashed by her father: "We warned him several times to stop his daughter from using dirty language against us, but he didn't listen and forced us to take this extreme step." The Taliban also justified its attack as part of religious scripture, stating that the Quran says that "people propagating against Islam and Islamic forces would be killed", going on to say that "Sharia says that even a child can be killed if he is propagating against Islam". On 12 October 2012, a group of 50 Islamic clerics in Pakistan issued a fatwā – a ruling of Islamic law – against the Taliban gunmen who tried to kill Yousafzai. Islamic scholars from the Sunni Ittehad Council publicly denounced attempts by the Pakistani Taliban to mount religious justifications for the shooting of Yousafzai and two of her classmates. Although the attack was roundly condemned in Pakistan, "some fringe Pakistani political parties and extremist outfits" have aired conspiracy theories, such as the shooting being staged by the American Central Intelligence Agency to provide an excuse for continuing drone attacks. The Pakistani Taliban and some other pro-Taliban elements branded Yousafzai an "American spy". On 15 October 2012, UN Special Envoy for Global Education Gordon Brown, the former British Prime Minister, visited Yousafzai while she was in the hospital, and launched a petition in her name and "in support of what Malala fought for". Using the slogan "I am Malala", the petition's main demand was that there be no child left out of school by 2015, with the hope that "girls like Malala everywhere will soon be going to school". Brown said he would hand the petition to President Zardari in Islamabad in November. The day after the shooting, Pakistan's Interior Minister Rehman Malik stated that the Taliban gunman who shot Yousafzai had been identified. Police named 23-year-old Atta Ullah Khan, a graduate student in chemistry, as the gunman in the attack. As of 2015[update] he remained at large, possibly in Afghanistan. The police also arrested six men for involvement in the attack, but they were later released due to lack of evidence. In November 2012, US sources confirmed that Mullah Fazlullah, the cleric who ordered the attack on Yousafzai, was hiding in Eastern Afghanistan. He was killed by a U.S.-Afghan air strike in June 2018. On 12 September 2014, ISPR Director, Major General Asim Bajwa, told a media briefing in Islamabad that the 10 attackers belong to a militant group called "Shura". General Bajwa said that Israrur Rehman was the first militant group member who was identified and apprehended by the troops. Acting upon the information received during his interrogation, all other members of the militant group were arrested. It was an intelligence-based joint operation conducted by ISI, police, and military. In April 2015, the ten who were arrested were sentenced to life in prison by Judge Mohammad Amin Kundi, a counterterrorism judge, with the chance of eligibility for parole, and possible release, after 25 years. It is not known if the actual would-be murderers were among the ten sentenced. In June 2015, it was revealed that eight of the ten men tried in-camera for the attack had in fact been secretly acquitted, insiders revealed one of the men acquitted and freed was the murder bid's mastermind. It is believed that all other men who shot Yousafzai fled to Afghanistan afterwards and were never even captured. The information about the release of suspects came to light after the London Daily Mirror attempted to locate the men in prison. Senior police official Salim Khan stated that the eight men were released because there was not enough evidence to connect them to the attack. Yousafzai spoke before the United Nations in July 2013, and had an audience with Queen Elizabeth II in Buckingham Palace. In September, she spoke at Harvard University, and in October, she met with US President Barack Obama and his family; during that meeting, she confronted him on his use of drone strikes in Pakistan. In December, she addressed the Oxford Union. In July 2014, Yousafzai spoke at the Girl Summit in London, advocating for rights for girls. In October 2014, after receiving the World Children's Prize for the rights of the child in Mariefred, Sweden, she announced donating $50,000 through the UNRWA, to help rebuild 65 schools in Gaza. Even though she was fighting for women's rights as well as children's rights, Yousafzai did not describe herself as a feminist when asked on Forbes Under 30 Summit in 2014. In 2015, however, Yousafzai told Emma Watson she decided to call herself a feminist after hearing Watson's speech at the UN launching the HeForShe campaign. On 12 July 2015, her 18th birthday, Yousafzai opened a school in the Bekaa Valley, Lebanon, near the Syrian border, for Syrian refugees. The school, funded by the not-for-profit Malala Fund, offers education and training to girls aged 14 to 18 years. Yousafzai called on world leaders to invest in "books, not bullets". Yousafzai has repeatedly condemned the Rohingya persecution in Myanmar. In June 2015, the Malala Fund released a statement in which Yousafzai argues that the Rohingya people deserve "citizenship in the country where they were born and have lived for generations" along with "equal rights and opportunities." She urges world leaders, particularly in Myanmar, to "halt the inhuman persecution of Burma's Muslim minority Rohingya people." In September 2017, speaking in Oxford, Yousafzai said: "This should be a human rights issue. Governments should react to it. People are being displaced, they're facing violence." Yousafzai also posted a statement on Twitter calling for Nobel Peace Prize laureate Aung San Suu Kyi to condemn the treatment of the Rohingya people in Myanmar. Suu Kyi has avoided taking sides in the conflict, or condemning violence against the Rohingya people, leading to widespread criticism. In 2014, Yousafzai stated that she wished to return to Pakistan following her education in the U.K., and inspired by Benazir Bhutto, she would consider running for prime minister: "If I can help my country by joining the government or becoming the prime minister, I would definitely be up for this task." She repeated this aim in 2015 and 2016. However, Yousafzai noted in 2018 that her goal had changed, stating that "now that I have met so many presidents and prime ministers around the world, it just seems that things are not simple and there are other ways that I can bring the change that I want to see". In an interview with David Letterman, for Netflix's show My Next Guest Needs No Introduction, Yousafzai was asked: "Would you ever want to hold a political position?" and replied "Me? No." Former British Prime Minister Gordon Brown arranged for Yousafzai's appearance before the United Nations in July 2013. Brown also requested that McKinsey consultant Shiza Shahid, a friend of the Yousafzai family, chair Yousafzai's charity fund, which had gained the support of Angelina Jolie. Google's vice-president Megan Smith also sits on the fund's board. On 12 July 2013, Yousafzai's 16th birthday, she spoke at the UN to call for worldwide access to education. The UN dubbed the event "Malala Day". Yousafzai wore one of Benazir Bhutto's shawls to the UN. It was her first public speech since the attack, leading the first ever Youth Takeover of the UN, with an audience of over 500 young education advocates from around the world. Words from the speech were used as lyrics for "Speak Out", a song by Kate Whitley commissioned by BBC Radio 3 and broadcast on International Women's Day 2017. On 10 October 2014, Yousafzai was announced as the co-recipient of the 2014 Nobel Peace Prize for her struggle against the suppression of children and young people and for the right of all children to education. Having received the prize at the age of 17, Yousafzai is the youngest Nobel laureate. Yousafzai shared the prize with Kailash Satyarthi, a children's rights activist from India. She is the second Pakistani to receive a Nobel Prize after 1979 Physics laureate Abdus Salam. After she was awarded the Nobel Peace Prize, there was praise, but also some disapproval of the decision. A Norwegian jurist, Fredrik Heffermehl, commented on being awarded the Nobel Prize: "This is not for fine people who have done nice things and are glad to receive it. All of that is irrelevant. What Nobel wanted was a prize that promoted global disarmament." Adán Cortés, a college student from Mexico City and asylum seeker, interrupted Yousafzai's Nobel Peace Prize award ceremony in protest for the 2014 Iguala mass kidnapping in Mexico, but was quickly taken away by security personnel. Yousafzai later sympathised, and acknowledged that problems are faced by young people all over the world, saying "there are problems in Mexico, there are problems even in America, even here in Norway, and it is really important that children raise their voices". In March 2018, Yousafzai was the subject of an interview with David Letterman for his Netflix show My Next Guest Needs No Introduction. Speaking about the Taliban, she opined that their misogyny comes from a superiority complex, and is reinforced by finding "excuses" in culture or literature, such as by misinterpreting teachings of Islam. On the topic of her attackers, Yousafzai comments that "I forgive them because that's the best revenge I can have". Pointing out that the person who attacked her was a young boy, she says that "He thought he was doing the right thing". Asked about the presidency of Donald Trump, Yousafzai said: "Some of the things have really disappointed me, like sexual harassment and the ban on Muslims and racism." She also criticised the Trump administration's proposed budget cuts to education, saying that education is the first step to "eradicating extremism and ending poverty". Throughout the episode, clips are shown of Yousafzai acting as a tour guide for prospective students to her college Lady Margaret Hall, Oxford. From March 2013 to July 2017, Yousafzai was a pupil at the all-girls Edgbaston High School in Birmingham. In August 2015, she received 6 A*s and 4 As at GCSE level. At A Level, she studied Geography, History, Mathematics and Religious Studies. Also applying to Durham, Warwick and the London School of Economics, Yousafzai was interviewed at Lady Margaret Hall, Oxford, in December 2016 and received a conditional offer of three As in her A Levels; in August 2017, she was accepted to study Philosophy, Politics and Economics (PPE). Conspiracy theorists in newspapers and on social media have alleged that Yousafzai staged her assassination attempt, or that she is an agent of the American Central Intelligence Agency. Many Pakistanis view her as an "agent of the West", due to her Nobel prize, Oxford education and residence in England. Another conspiracy theory alleges that Yousafzai is a Jewish agent. However, Yousafzai does have some support in Pakistani media; Farman Nawaz argues that Yousafzai would have gained more fame in Pakistan if she belonged to the province of Punjab. His opinion was not given importance by the mainstream media of Pakistan but his views in this regard were published by Daily Outlook Afghanistan. Yousafzai is seen as courageous by some Pakistanis. On 29 March 2018, Yousafzai returned to Pakistan for the first time since the shooting. Meeting Prime Minister Shahid Khaqan Abbasi, she gave a speech in which she said it had been her dream to return "without any fear". Yousafzai then visited her hometown Mingora in Swat Valley. The APPSF, a group representing the 173,000 private schools in Pakistan, organised "I am not Malala Day" on 30 March. Yousafzai responded by saying "I am proud of my religion, and I am proud of my country." April 2013: One of Time's "100 Most Influential People in the World"
2017: Harper's Bazaar inducted Malala in the list of "150 of the most influential female leaders in the UK". 2019: For their first match of March 2019, the women of the United States women's national soccer team each wore a jersey with the name of a woman they were honoring on the back; Carli Lloyd chose the name of Yousafzai. Yousafzai's memoir I Am Malala: The Story of the Girl Who Stood Up for Education and was Shot by the Taliban, co-written with British journalist Christina Lamb, was published in October 2013 by Little, Brown and Company in the US and by Weidenfeld & Nicolson in the UK. A reviewer for The Guardian called the book "fearless" and stated that "the haters and conspiracy theorists would do well to read this book", though she criticised "the stiff, know-it-all voice of a foreign correspondent" that is interwoven with Yousafzai's. A reviewer for The Washington Post called the book "riveting" and wrote "It is difficult to imagine a chronicle of a war more moving, apart from perhaps the diary of Anne Frank." Entertainment Weekly gave the book a "B+", writing "Malala's bravely eager voice can seem a little thin here, in I Am Malala, likely thanks to her co-writer, but her powerful message remains undiluted." A children's edition of the memoir was published in 2014 under the title I Am Malala: How One Girl Stood Up for Education and Changed the World. According to Publishers Weekly, in 2017 the book had sold almost 2 million copies, and there were 750,000 copies of the children's edition in print. Yousafzai was the subject of the 2015 documentary He Named Me Malala, which was nominated for the Academy Award for Best Documentary Feature. In 2017, a Hindi biopic film Gul Makai was announced, with Reem Sameer Shaikh portraying her. Yousafzai authored a picture book, Malala's Magic Pencil, which was illustrated by Kerascoët and published on 17 October 2017. By March 2018, The Bookseller reported that the book had over 5,000 sales in the UK. In a review for The Guardian, Imogen Carter describes the book as "enchanting", opining that it "strikes just the right balance" between "heavy-handed" and "heartfelt", and is a "welcome addition to the frustratingly small range of children's books that feature BAME central characters". Rebecca Gurney of The Daily Californian gives the book a grade of 4.5 out of 5, calling it a "beautiful account of a terrifying but inspiring tale" and commenting "Though the story begins with fantasy, it ends starkly grounded in reality." In March 2018, it was announced that Yousafzai's next book We Are Displaced: True Stories of Refugee Lives would be published on 4 September 2018 by Little, Brown and Company's Young Readers division. The book is about refugees, and includes stories from Yousafzai's own life along with those of people she has met. Speaking about the book, Yousafzai said that "What tends to get lost in the current refugee crisis is the humanity behind the statistics" and "people become refugees when they have no other option. This is never your first choice." Profits from the book will go to Yousafzai's charity Malala Fund. She visited Australia and criticized its asylum policies and compared immigration policies of the U.S. and Europe unfavourably to those of poor countries and Pakistan. The book was released on 8 January 2019. ^ D'Amours, Jillian Kestler. "Malala Yousafzai made an honorary Canadian citizen". Al Jazeera. Jillian Kestler-D'Amours. Archived from the original on 30 December 2017. Retrieved 29 December 2017. ^ a b امنسټي انټرنېشنل پر ملاله یوسفزۍ برید وغانده (in Pashto). BBC Pashto. 18 October 2012. Archived from the original on 25 November 2012. Retrieved 11 October 2013. ^ a b c d e f g h i j Adam B. Ellick (2009). Class Dismissed. The New York Times (documentary). Archived from the original on 11 October 2012. Retrieved 11 October 2012. ^ "Malala Yousafzai Becomes Youngest-Ever Nobel Prize Winner". 10 October 2014. Archived from the original on 10 October 2014. Retrieved 11 October 2014. ^ Johnson, Kay (28 March 2018). "Nobel winner Malala in tears on emotional return to Pakistan". Reuter's. Archived from the original on 29 March 2018. Retrieved 29 March 2018. ^ a b "Following in Benazir's footsteps, Malala aspires to become PM of Pakistan". The Express Tribune. 10 December 2014. Archived from the original on 17 August 2016. Retrieved 12 September 2016. ^ Schifrin, Nick (7 October 2013). "The 72 Hours That Saved Malala: Doctors Reveal for the First Time How Close She Came to Death". Good Morning America. Yahoo! News. Archived from the original on 23 October 2014. Retrieved 10 October 2014. ^ Kyle McKinnon (18 January 2013). "Will Malala's Influence Stretch to Europe?". Deutsche Welle. Archived from the original on 18 August 2013. Retrieved 24 July 2013. ^ "Malala Yousafzai: 'fatwa' issued against gunmen". The Guardian. 12 October 2012. Archived from the original on 21 August 2017. Retrieved 21 August 2017. ^ "$7 million from Malala Fund for education project in remote areas". DAWN.COM. 12 April 2014. Archived from the original on 6 January 2017. Retrieved 3 February 2017. ^ "Best Sellers – November 3, 2013 – The New York Times". Archived from the original on 28 January 2017. Retrieved 3 February 2017. ^ "Malala Yousafzai Receiving Honorary Canadian Citizenship Wednesday". Huffington Post. The Canadian Press. 15 October 2013. Archived from the original on 16 October 2013. Retrieved 17 October 2013. ^ "Nobel Laureates by Age". nobelprize.org. 20 October 2014. Archived from the original on 10 October 2014. Retrieved 20 October 2014. ^ a b "Malala Yousafzai becomes youngest-ever Nobel Prize winner". The Express Tribune. 10 October 2014. Archived from the original on 13 October 2014. Retrieved 10 October 2014. ^ a b c "The Nobel Peace Prize for 2014" (Press release). Oslo: Nobel Media AB. 10 October 2014. Archived from the original on 10 October 2014. Retrieved 10 October 2014. ^ "Malala Yousafzai awarded honorary Canadian citizenship". DAWN.COM. 12 April 2017. Archived from the original on 13 April 2017. Retrieved 12 April 2017. ^ a b "Malala Yousafzai attends first day at Edgbaston High School in Birmingham". BBC News. 19 March 2013. Archived from the original on 26 December 2014. Retrieved 30 October 2014. ^ "A level results: Malala Yousafzai gets a place at Oxford". BBC News. 17 August 2017. Archived from the original on 17 August 2017. Retrieved 17 August 2017. ^ Rowell, Rebecca (1 September 2014). Malala Yousafzai: Education Activist. ABDO. p. 45. ISBN 978-1-61783-897-2. Retrieved 18 August 2017. ^ Thomas, Rebecca (6 November 2015). "Malala Yousafzai: Her father's daughter". BBC News. Archived from the original on 21 April 2017. ^ Saleem Ali (14 October 2012). "Malala and Sharbat Gula: Pashtun Icons of Hope". National Geographic. University of Queensland, Australia. Archived from the original on 26 October 2013. Retrieved 29 September 2013. ^ Throp, Claire (2015). Malala Yousafzai. Heinemann Raintree. p. 12. ISBN 978-1-4846-2469-2. Retrieved 19 August 2017. ^ a b c "Diary of a Pakistani schoolgirl". BBC News. 19 January 2009. Archived from the original on 11 October 2012. Retrieved 11 October 2012. ^ "Bacha Khan's philosophy of non-violence and Benazir Bhutto's charisma inspires Malala". The Express Tribune. 16 January 2012. Archived from the original on 16 October 2012. Retrieved 11 October 2012. ^ Tooley, James. "Malala for free schools: Why does the media hide the fact that she's for educational choice — as are so many developing nations?". The Spectator. Archived from the original on 13 November 2013. Retrieved 13 November 2013. ^ Coulson, Andrew J. "Why Malala Didn't Go to Public School". Cato Institute. Archived from the original on 13 November 2013. Retrieved 13 November 2013. ^ a b Owais Tohid (11 October 2012). "My conversations with Malala Yousafzai, the girl who stood up to the Taliban". The Christian Science Monitor. p. 3. Archived from the original on 12 October 2012. Retrieved 11 October 2012. ^ Adam B. Ellick (9 October 2012). "My 'Small Video Star' Fights for Her Life". The New York Times. Archived from the original on 10 October 2012. Retrieved 11 October 2012. ^ Westhead, Rick (26 October 2009). "Brave defiance in Pakistan's Swat Valley". Toronto Star. Archived from the original on 13 October 2012. Retrieved 15 October 2012. ^ "Young Journalist Inspires Fellow Students". Institute for War and Peace Reporting. 5 December 2009. Archived from the original on 10 July 2015. Retrieved 15 July 2015. ^ "Pakistani Heroine: How Malala Yousafzai Emerged from Anonymity". Time World. 23 October 2012. Archived from the original on 20 October 2013. Retrieved 12 October 2013. ^ a b c d e f g h i j Peer, Basharat (10 October 2012). "The Girl Who Wanted To Go To School". The New Yorker. Archived from the original on 12 October 2012. Retrieved 15 October 2012. ^ a b "Malala Yousafzai: Portrait of the girl blogger". BBC News. 10 October 2012. Archived from the original on 11 October 2012. Retrieved 11 October 2012. ^ a b c "Young Pakistani Journalist Inspires Fellow Students". Institute of War & Peace Reporting. 15 January 2010. Archived from the original on 30 May 2016. Retrieved 28 April 2016. ^ Jon Boone (9 October 2012). "Malala Yousafzai: Pakistan Taliban causes revulsion by shooting girl who spoke out". The Guardian. London. Archived from the original on 8 October 2013. Retrieved 12 October 2012. ^ Ali, Manzoor (12 October 2012). "Where it all started: 'A diary that highlighted Swat's human tragedy'". The Express Tribune. Archived from the original on 20 April 2013. Retrieved 15 October 2012. The name Gul Makai – a heroine of Pakhtun folktale – was chosen as an apt pseudonym meant to strike a chord with the local population so they could easily identify with Malala's blog, he added. ^ Rose, H.A. (1911). A Glossary of the Tribes and Castes of the Punjab and North-West Frontier Province. 1. p. 56. Archived from the original on 10 November 2013. Retrieved 15 October 2012. Yet another legend of Yusufzai origin is often recited by the Kurram Dums. It enshrines the lives of Musa Khan and Gulmakai, their quarrels and final reconciliation. It is very well known I believe on the Peshawar side, and has probably been already recorded. ^ a b c d e f g h i j "Swat: Diary of a Pakistani schoolgirl (Malala Yousafzai) – BBC". original Urdu and English translation of Yousufzai's blog. LUBP. Archived from the original on 15 July 2010. Retrieved 16 October 2012. ^ "Pakistan media condemn attack on Malala Yousafzai". BBC News. 9 October 2012. Archived from the original on 22 April 2013. Retrieved 23 July 2013. ^ Malala Yousufzai. "(Part 10 of Yousfzai's blog)" (in Urdu). BBC Urdu. Archived from the original on 12 October 2012. Retrieved 16 October 2012. ^ "Capital Talk on Wednesday, August 19, 2009". Pakistan Herald. 19 August 2009. Archived from the original on 10 November 2013. Retrieved 23 July 2013. ^ "Young Journalist Inspires Fellow Students". Institute for War & Peace Reporting. 9 December 2009. Archived from the original on 10 January 2013. Retrieved 15 October 2012. ^ van Gilder Cooke, Sonia (23 October 2012). "Pakistani Heroine: How Malala Yousafzai Emerged from Anonymity". Time. Archived from the original on 23 October 2012. Retrieved 24 October 2012. ^ "Child Assembly ensures a voice for youth affected by crises in Swat, Pakistan". Archived from the original on 29 July 2016. ^ "District Child Assembly Swat 2009". Archived from the original on 9 June 2016. ^ Briggs, Billy. "The Peshawar women fighting the Taliban: 'We cannot trust anyone'". The Guardian. Retrieved 13 December 2018. ^ a b c "Desmond Tutu announces nominees Children's Peace Prize 2011". The International Children's Peace Prize. 25 October 2011. Archived from the original on 8 March 2012. Retrieved 15 October 2012. 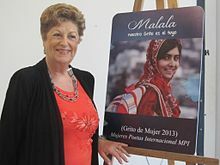 ^ "Michaela Mycroft winner of International Children's Peace Prize 2011". International Children's Peace Prize. 21 November 2011. Archived from the original on 27 January 2016. Retrieved 21 November 2011. ^ "Malala in the House, plans to launch political party". Dawn. Pakistan. 4 January 2012. Archived from the original on 25 September 2012. Retrieved 11 October 2012. ^ Sumera Khan (20 December 2011). "National peace prize named after Malala Yousafzai". The Express Tribune. Archived from the original on 13 February 2012. Retrieved 11 October 2012. ^ Mehsud, Saud (10 October 2012). "Malala Yousufzai: Pakistani schoolgirl had defied threats from Taliban for years (+video)". The Christian Science Monitor. Archived from the original on 15 October 2012. Retrieved 15 October 2012. ^ a b "'Radio Mullah' sent hit squad after Malala Yousafzai". The Express Tribune. 12 October 2012. Archived from the original on 14 October 2012. Retrieved 15 October 2012. ^ a b c d From the Preface to the 2014 edition of I Am Malala, page xix. ISBN 9781780226583. ^ Asma Ali Zain (4 November 2012). "Malala will soon undergo reconstructive surgery". Khaleej Times. Archived from the original on 5 November 2012. Retrieved 4 November 2012. ^ a b Declan Walsh (12 October 2012). "Taliban Reiterate Vow to Kill Pakistani Girl". The New York Times. Archived from the original on 13 October 2012. Retrieved 12 October 2012. ^ Mushtaq Yusufza (9 October 2012). "Pakistani teen blogger shot by Taliban 'critical' after surgery". NBC News. Archived from the original on 12 October 2012. Retrieved 11 October 2012. ^ a b Robert Mackey; Adam B. Ellick (11 October 2012). "Pakistani Girl Airlifted to Military Hospital". The New York Times. Archived from the original on 14 October 2012. Retrieved 11 October 2012. ^ Nasir Habib; Reza Sayah (11 October 2012). "Official: Pakistani teen blogger's shooting a 'wake-up call' to 'clear ... danger'". CNN. Archived from the original on 11 October 2012. Retrieved 11 October 2012. ^ "Malala to be shifted to Germany: Malik". Associated Press of Pakistan. 11 October 2012. Archived from the original on 16 November 2012. Retrieved 11 October 2012. ^ a b Palash R. Ghosh (10 October 2012). "Malala Yousafzai: Family Refuses To Cower In Fear As Girl Remains In Critical Condition". International Business Times. Archived from the original on 11 October 2012. Retrieved 11 October 2012. ^ Palmer, Elizabeth (13 October 2012). "Indications of hope for shot Pakistani girl". CBS. Archived from the original on 15 October 2012. Retrieved 15 October 2012. ^ Walsh, Declan (15 October 2012). "Global Outpouring to Help Pakistani Schoolgirl/Girl Shot by Taliban Arrives in Britain for Treatment". The New York Times. Archived from the original on 16 October 2012. Retrieved 16 October 2012. ^ "Malala Yousafzai: Pakistani girl shot by Taliban to be treated in Birmingham hospital that treats wounded soldiers". The Telegraph. London. 15 October 2012. Retrieved 15 October 2012. ^ "Malala Yousafzai: Pakistani girl shot by Taliban to be treated in Birmingham hospital that treats wounded soldiers". The Daily Telegraph. 15 October 2012. Archived from the original on 27 March 2015. Retrieved 11 November 2014. ^ Bennett, Dashiell (17 October 2012). "Malala Yousufzai Comes Out of Her Coma". Atlantic Wire. Archived from the original on 19 October 2012. Retrieved 17 October 2012. ^ "Malala Yousafzai status updates". Queen Elizabeth Hospital. 22 October 2012. Archived from the original on 21 October 2012. Retrieved 22 October 2012. ^ "Schoolgirl shot by Taliban says she has been 'humbled and inspired by messages of support'". ITV News. 9 November 2012. Archived from the original on 9 November 2012. Retrieved 9 November 2012. ^ "Malala Yousafzai to undergo cranial reconstructive surgery in UK". India Today. Archived from the original on 13 October 2013. Retrieved 4 January 2013. ^ "Pakistani girl Malala released from hospital". CNN. 4 January 2013. Archived from the original on 6 January 2013. Retrieved 4 January 2013. ^ "Girl shot by Taliban in stable condition after two operations to reconstruct skull and restore hearing". New York Post. Retrieved 3 February 2013. ^ "Malala Yousafzai, Pakistani Girl Shot by Taliban Militants". Archived from the original on 5 February 2013. Retrieved 6 March 2016. ^ Yusuf, Huma (16 November 2012). "Ghost Education". The New York Times. Archived from the original on 4 January 2014. ^ "Education is now compulsory for Pakistani children". NDTV.com. 14 November 2012. Archived from the original on 17 October 2013. Retrieved 13 October 2013. ^ "Quiet Progress for Education in Pakistan". Brookings Institution. 8 April 2013. Archived from the original on 12 October 2013. Retrieved 13 October 2013. ^ "Malala Yousafzai: Pakistan girl 'strong' – doctors". BBC News. 16 October 2012. Archived from the original on 16 October 2012. Retrieved 16 October 2012. ^ "UN chief strongly condemns 'heinous and cowardly' attack on Pakistani schoolgirl". UN News Service. 10 October 2012. Archived from the original on 14 October 2012. Retrieved 11 October 2012. ^ "Pakistani teen still critical, Obama calls attack tragic". Yahoo News. Indo Asian News Service. 11 October 2012. Archived from the original on 4 February 2013. Retrieved 11 October 2012. ^ "Malala Yousafzai: Reward offered for arrest of attackers". BBC News. 10 October 2012. Archived from the original on 10 October 2012. Retrieved 11 October 2012. ^ "Teen girl Malala Yousafzai shot by Taliban has a 'good chance' of recovery". The Australian. Agence France-Presse. 16 October 2012. Archived from the original on 29 January 2014. Retrieved 24 July 2013. ^ Seth Abramovitch (11 October 2012). "Madonna Dedicates L.A. Performance to Child Activist Shot in Pakistan". The Hollywood Reporter. Archived from the original on 13 October 2012. Retrieved 11 October 2012. ^ "Madonna Strips For Malala Yousafzai, Dedicates Song To Young Pakistani Woman Shot By Taliban". The Huffington Post. 15 October 2012. Archived from the original on 2 October 2014. Retrieved 10 October 2014. ^ Jolie, Angelina (16 October 2012). "Angelina Jolie: We All Are Malala". The Daily Beast. Archived from the original on 19 October 2012. Retrieved 19 October 2012. ^ "Angelina Jolie Donates $200,000 to the Malala Fund". ABC News. 5 April 2013. Archived from the original on 25 June 2013. Retrieved 24 July 2013. ^ Bush, Laura (10 October 2012). "A girl's courage challenges us to act". The Washington Post. Archived from the original on 25 October 2012. Retrieved 22 October 2012. ^ "Indian director to make biopic on Malala Yousufzai". The Express Tribune. 7 December 2012. Archived from the original on 10 December 2012. Retrieved 10 December 2012. ^ Richard Leiby; Michele Langevine Leiby (10 October 2012). "Taliban says it shot Pakistani teen for advocating girls' rights". The Washington Post. Archived from the original on 11 October 2012. Retrieved 11 October 2012. ^ "Malala Yousafzai deserved to die, say Taliban". The Guardian. London. 16 October 2012. Archived from the original on 16 October 2012. Retrieved 16 October 2012. ^ Jon Boone (12 October 2012). "Malala Yousafzai: 'fatwa' issued against gunmen". The Guardian. Archived from the original on 20 October 2013. Retrieved 12 October 2012. ^ "Taliban threat worries Pakistan media". BBC. 17 October 2012. Archived from the original on 24 November 2012. Retrieved 30 November 2012. ^ Venky Vembu (15 October 2012). "How Pak jihadi minds justify attack on Malala: Perversely". firstpost.com. Archived from the original on 15 October 2012. Retrieved 15 October 2012. ^ "TTP labels Malala as 'an American spy'". The News. 16 October 2012. Archived from the original on 22 March 2013. Retrieved 20 October 2012. ^ Mackey, Robert (16 October 2012). "After a Bullet in the Head, Assaults on a Pakistani Schoolgirl's Character Follow". The New York Times. Archived from the original on 19 October 2012. Retrieved 20 October 2012. ^ Taqi, Mohammad (18 October 2012). "Malala and anti-Malala Pakistan". Daily Times. Archived from the original on 21 October 2012. Retrieved 20 October 2012. ^ Walsh, Declan (18 October 2012). "Pakistani Police Detain Family of Suspect in Attack on Girl". The New York Times. Archived from the original on 20 October 2012. Retrieved 20 October 2012. ^ a b c d "Malala Inc: Global operation surrounds teenage activist". Agence France-Presse. Archived from the original on 11 October 2013. Retrieved 12 October 2013. ^ a b "Malala Yousafzai: Taliban shooting victim flown to UK". BBC. 15 October 2012. Archived from the original on 15 October 2012. Retrieved 15 October 2012. ^ a b "A World at School". The Office of the UN Special Envoy for Global Education. Archived from the original on 24 October 2012. Retrieved 15 October 2012. ^ "Pakistani Interior Minister: Taliban Gunman Who Shot 14-Year-Old Girl Identified". VOA News. 10 October 2012. Archived from the original on 13 October 2012. Retrieved 11 October 2012. ^ "Arrests made in shooting of Pakistani schoolgirl Malala". CNN. 28 October 2012. Archived from the original on 10 October 2013. Retrieved 24 July 2013. ^ a b "Malala at U.N.: The Taliban failed to silence us". CNN. 12 July 2013. Archived from the original on 27 July 2013. Retrieved 24 July 2013. ^ a b Zahir Shah; Greg Botelho (30 April 2015). "Pakistan: 10 sentenced to life in prison for attack on Malala Yousafzai". CNN. Archived from the original on 1 May 2015. ^ "Mullah Fazlullah hiding in Afghanistan: US officials". The Express Tribune. 8 November 2012. Archived from the original on 9 November 2012. Retrieved 8 November 2012. ^ "Air Strike Kills Pakistani Taliban Leader Who Reportedly Ordered Attack On Malala". Huffington Post. Reuters. 15 June 2018. Retrieved 15 June 2018. ^ "Malala Yousafzai's attackers arrested: ISPR". Pakistan Today. 12 September 2014. Archived from the original on 3 November 2014. Retrieved 10 October 2014. ^ Dockterman, Eliana (12 September 2014). "Malala's Attackers Arrested in Pakistan". Time. Reuters. Archived from the original on 12 October 2014. Retrieved 13 October 2014. ^ Hughes, Chris. "Brave Malala's hitmen secretly FREED just weeks after their 25-year prison sentences". Daily Mirror. MGN Ltd. Archived from the original on 5 June 2015. Retrieved 5 June 2015. ^ "Pakistan court frees eight men charged with attack on schoolgirl Malala". Reuters. 5 June 2015. Archived from the original on 2 October 2015. Retrieved 4 November 2015. ^ Emma Batha (23 July 2014). "Malala tells Girl Summit education is key to ending child marriage". Thompson Reuters Foundation. Archived from the original on 21 November 2014. Retrieved 4 May 2015. ^ a b "Malala Confronts Obama". CNN. 12 October 2013. Archived from the original on 12 October 2013. Retrieved 12 October 2013. ^ a b "Malala, une entreprise". Le Point. Agence France-Presse. 11 October 2013. Archived from the original on 14 October 2013. Retrieved 12 October 2013. ^ "Malala Yousafzai's Toughest Battle?". The Huffington Post. Archived from the original on 10 December 2014. ^ "Freida Pinto speaks at girls' rights summit in UK". The Houston Chronicle. Associated Press. 22 July 2014. Archived from the original on 29 July 2014. ^ Meikle, James (29 October 2014). "Malala Yousafzai gives $50,000 to reconstruction of Gaza schools". The Guardian. Archived from the original on 30 October 2014. Retrieved 30 October 2014. ^ "The Feminist Life: Malala Won't Use the F-Word". Archived from the original on 12 February 2015. ^ "Malala on Peace, Drones and Islam". Forbes. Archived from the original on 17 August 2017. ^ "Malala tells Emma Watson she identifies as a feminist, thanks to her". Women in the World in Association with The New York Times – WITW. Archived from the original on 7 November 2015. ^ Mendoza, Jessica (13 July 2015). "Malala Yousafzai urges global investment in 'books, not bullets'". The Christian Science Monitor. Retrieved 13 July 2015. ^ Westall, Sylvia (13 July 2015). "Nobel winner Malala opens school for Syrian refugees". Reuters. Archived from the original on 14 July 2015. Retrieved 13 July 2015. ^ Khaliq, Fazal (8 June 2015). "Malala calls on world leaders to save Rohingya Muslims". Dawn. Archived from the original on 20 February 2018. Retrieved 12 December 2017. ^ Rhodan, Maya (8 June 2015). "Malala Says Burma's Rohingya Muslims 'Deserve Citizenship'". Time. Archived from the original on 15 December 2016. Retrieved 12 December 2017. ^ Coughlan, Sean (8 September 2017). "Malala calls for defence of Rohingya". BBC. Archived from the original on 28 November 2017. Retrieved 12 December 2017. ^ Hincks, Joseph (4 September 2017). "Malala Yousafzai Says 'the World Is Waiting' for Suu Kyi to Condemn Treatment of Myanmar's Rohingya". Time. Archived from the original on 22 September 2017. ^ "Malala Yousafzai — future prime minister of Pakistan?". DAWN. 10 December 2014. Archived from the original on 14 March 2018. Retrieved 13 March 2018. ^ Kellaway, Kate (25 October 2015). "Malala Yousafzai: 'I want to become prime minister of my country'". The Guardian. Archived from the original on 13 March 2018. Retrieved 13 March 2018. ^ Medrano, Kastalia (20 October 2016). "Malala Yousafzai Wants To Become The Prime Minister Of Pakistan". Time. Archived from the original on 9 April 2018. Retrieved 13 March 2018. ^ Gentleman, Amelia (11 March 2018). "Malala Yousafzai: 'The west is viewed as an ideal, but there's still a lot of work to be done'". The Guardian. Archived from the original on 13 March 2018. Retrieved 13 March 2018. ^ Wilstein, Matt (8 March 2018). "Malala Yousafzai Sounds Off on Trump to Letterman: 'I'm a Muslim,' Does He Want to Ban Me?". The Daily Beast. Archived from the original on 9 March 2018. Retrieved 13 March 2018. ^ a b c d Mackinnon, Mark (8 October 2013). "One year after being shot by the Taliban, Malala Yousafzai is a mighty machine". The Globe and Mail. Toronto. Archived from the original on 11 October 2013. Retrieved 12 October 2013. ^ a b "Shot Pakistan schoolgirl Malala Yousafzai addresses UN". BBC News. 12 July 2013. Archived from the original on 18 July 2013. Retrieved 23 July 2013. ^ a b Michelle Nichols (12 July 2013). "Pakistan's Malala, shot by Taliban, takes education plea to U.N." Reuters. Archived from the original on 23 July 2013. Retrieved 23 July 2013. ^ "Global action on education doesn't end with Malala Day". Ottawa Citizen. Archived from the original on 14 October 2013. Retrieved 13 October 2013. ^ "The Education We Want" (PDF). United Nations Global Education First Initiative. 12 July 2013. Archived from the original (PDF) on 6 September 2015. Retrieved 4 May 2015. ^ "Youth Advocacy Group". UN Global Education First Initiative – United Nations Secretary General's Global Initiative on Education. Archived from the original on 15 October 2014. Retrieved 10 October 2014. ^ "Malala Yousafzai's speech at the United Nations". A World at School. Archived from the original on 26 July 2013. Retrieved 13 October 2013. ^ a b c Ghafour, Hamida (19 June 2013). "Malala Yousafzai: Backlash against Pakistani teen activist spreads in her homeland". Toronto Star. Archived from the original on 3 August 2013. Retrieved 7 August 2013. ^ a b Huma Yusuf (18 July 2013). "About the Malala Backlash". The New York Times. Archived from the original on 19 October 2014. Retrieved 13 May 2018. ^ "BBC National Orchestra to perform Malala speech premiere". BBC. 8 March 2017. Retrieved 2 September 2018. ^ Evans, Rian (9 March 2017). "BBCNOW/Zhang – Malala's message is set to music". The Guardian. Retrieved 2 September 2018. ^ "A Look at the Top 10 Youngest Nobel Laureates". Yahoo!-ABC News Network. 10 October 2014. Archived from the original on 5 May 2015. Retrieved 11 October 2014. ^ Cowell, Alan; Walshoct, Declan (10 October 2014). "Nobel Peace Prize for Malala Yousafzai and Kailash Satyarthi". The New York Times. Archived from the original on 18 October 2014. Retrieved 10 October 2014. ^ "Le prix Nobel de la paix attribué à Malala Yousafzai et Kailash Satyarthi". Ijsberg Magazine (in French). 10 October 2014. Archived from the original on 17 October 2014. Retrieved 10 October 2014. ^ "Nobel peace prize decision is highly political". The Guardian. 10 October 2014. Archived from the original on 13 October 2014. Retrieved 11 October 2014. ^ "Malala Yousafzai: Mixed Reaction in Pakistan to Teenage Activists Nobel Prize Award". International Business Times. 11 October 2014. Archived from the original on 14 October 2014. Retrieved 11 October 2014. ^ Walsh, Declan (10 October 2014). "Two Champions of Children Are Given Nobel Peace Prize". The New York Times. Archived from the original on 10 October 2014. Retrieved 11 October 2014. ^ "Malala Yousafzai says Mexican protester's actions show 'There are problems in Mexico'". FOX News Latino. Associated Press. 11 December 2014. Archived from the original on 2 April 2015. Retrieved 5 March 2015. ^ a b Kilkenny, Katie (9 March 2018). "Malala Yousafzai Shares Thoughts on Trump, Jay-Z on David Letterman Talk Show". The Hollywood Reporter. Archived from the original on 9 March 2018. Retrieved 13 March 2018. ^ "Malala talks about education, extremism and politics with David Letterman". Geo TV. 9 March 2018. Archived from the original on 13 March 2018. Retrieved 13 March 2018. ^ "Malala discusses Trump, girls' education and Muslim ban on David Letterman's show". The Express Tribune. 9 March 2018. Archived from the original on 14 March 2018. Retrieved 13 March 2018. ^ Elgot, Jessica (21 August 2015). "Malala Yousafzai celebrates string of A* grades at GCSE". The Guardian. Archived from the original on 25 October 2017. Retrieved 24 October 2017. ^ a b Hill, Amelia (17 August 2017). "Schoolgirl campaigner Malala Yousafzai wins Oxford university place". The Guardian. Archived from the original on 24 October 2017. Retrieved 24 October 2017. ^ Helen Regan (17 August 2017). "Malala Yousafzai Has Been Accepted to Study at Oxford University". Time.com. Archived from the original on 17 August 2017. Retrieved 17 August 2017. ^ a b Cyril Almeida (13 October 2013). "Hating Malala". Dawn. Archived from the original on 29 December 2013. Retrieved 13 May 2018. ^ a b Turk, Shoaib (21 April 2018). "Seven types of people in Pakistan who hate Malala Yousufzai". The Nation. Retrieved 13 May 2018. ^ a b c Inayat, Naila (18 April 2018). "Malala Yousafzai is adored around the world, but many in Pakistan have come to hate her". USA Today. Retrieved 13 May 2018. ^ a b Khan, Mohammad Zubair; Diver, Tony (30 March 2018). "Malala to return to Pakistan after finishing her studies in Britain". The Daily Telegraph. Retrieved 13 May 2018. ^ a b Ali, Sarfraz (29 March 2018). "'I am not Malala' Day: Pakistani teachers protest Nobel laureate's return after 6 years". Daily Pakistan. Retrieved 13 May 2018. ^ "I am not Malala: Teachers release novel against Nobel Peace winner". The Express Tribune. 12 November 2015. Retrieved 13 May 2018. ^ Ansar Abbasi (22 October 2013). "Malala exposes herself to criticism". The News International. Archived from the original on 16 October 2014. Retrieved 29 June 2014. ^ a b Sikandar, Salman (17 April 2018). "Keep beating your drums of hatred, this iron lady is unbeatable!". The Nation. Retrieved 13 May 2018. ^ Farman Nawaz. "Noble Prize Winner's Fate in Pakistan". Daily Outlook Afghanistan, the Leading Independent Newspaper. Archived from the original on 2 April 2015. ^ "As Malala returns to Pakistan, leaders declare terrorism defeated". CBS News. 29 March 2018. Archived from the original on 1 April 2018. Retrieved 31 March 2018. ^ "Malala returns to Pakistan for first time". BBC News. 29 March 2018. Archived from the original on 29 March 2018. Retrieved 29 March 2018. ^ "Malala returns to home town in Pakistan for first time since shooting". BBC. 31 March 2018. Archived from the original on 31 March 2018. Retrieved 31 March 2018. ^ "Malala Yousafzai to receive Anne Frank courage award". BBC News. 29 January 2014. Archived from the original on 21 May 2014. Retrieved 19 October 2014. ^ Rocker, Simon (13 January 2014). "Malala to get Anne Frank courage award". The Jewish Chronicle. Archived from the original on 19 October 2014. Retrieved 19 October 2014. ^ "Malala Yousufzai to be given Pak's highest civilian bravery award". The Indian Express. 16 October 2012. Archived from the original on 20 October 2012. Retrieved 16 October 2012. ^ Carbone, Nick (18 December 2012). "TIME Reveals Its Short List for Person of the Year 2012". Time. Archived from the original on 19 December 2012. Retrieved 20 December 2012. ^ "How Malala Yousafzai got a Mumbai award". Indo-Asian News Service. 9 December 2012. Archived from the original on 9 December 2012. ^ "Teresa awards given away". The Indian Express. 29 November 2012. Archived from the original on 3 December 2012. Retrieved 9 December 2012. ^ "Mother Teresa Awards 2012". Mother Teresa Awards: A Harmony Foundation Initiatives. Archived from the original on 15 December 2014. Retrieved 15 December 2014. ^ "Top words of 2012 capture 'impending doom'". USA Today. 1 January 2013. Archived from the original on 10 November 2013. Retrieved 7 October 2013. ^ Payne, Cathy (30 December 2011). "Teenage icon: Rome again honours Malala, father collects reward". The Express Tribune. Archived from the original on 1 January 2013. Retrieved 30 December 2012. ^ "Awarding of the Simone de Beauvoir Prize to Malala Yousafzai". France Diplomatie. 9 January 2013. Archived from the original on 10 November 2013. Retrieved 25 July 2013. ^ "Stadt Memmingen: Malala Yousafzai erhält den "Memminger Freiheitspreis 1525"". Archived from the original on 16 October 2014. Retrieved 10 October 2014. ^ "Memminger Freiheitspreis an Malala Yousafzai überreicht". all-in.de – das Allgäu online. Archived from the original on 17 October 2014. Retrieved 10 October 2014. ^ Yasin, Sara (21 March 2013). "Winners – Index Awards 2013". Index on Censorship. Archived from the original on 2 September 2013. Retrieved 12 July 2013. ^ "The Fred & Anne Jarvis Award". NUT. 29 March 2013. Archived from the original on 31 October 2013. Retrieved 16 April 2013. ^ "2013 Global Leadership Awards". Vital Voices. Archived from the original on 23 June 2013. Retrieved 12 July 2013. ^ "Premi Internacional Catalunya". Generalitat de Catalunya. 27 May 2013. Archived from the original on 10 November 2013. Retrieved 12 July 2013. ^ "Malala Yousafzai receives OFID 2013 Annual Award for Development". Ofid.org. 13 June 2013. Archived from the original on 10 November 2013. Retrieved 12 July 2013. ^ GNM press office (13 June 2013). "Malala Yousafzai and Joanna Lumley honoured as International and British Campaigners of the Year at the 2013 Observer Ethical Awards". The Guardian. London. Archived from the original on 10 November 2013. Retrieved 12 July 2013. ^ "Malala Yousafzai gets peace prize". Daily Express. 21 August 2013. Retrieved 23 August 2013. ^ "Jonathan Yeo portrait of Malala to go on display". BBC News. 10 September 2013. Archived from the original on 10 September 2013. Retrieved 10 September 2013. ^ Davies, Will (17 September 2013). "Malala Yousafzai Gets Amnesty's Top Honor". The Wall Street Journal. Archived from the original on 21 September 2013. Retrieved 19 September 2013. ^ "Malala awarded 2013 Children's Peace Prize". Pakistan Tribune. Agence France-Presse. 27 August 2013. Archived from the original on 27 August 2013. Retrieved 27 August 2013. ^ "Childrenspeaceprize > Winners > 2013". KidsRights Foundation. 6 September 2013. Archived from the original on 16 April 2016. Retrieved 25 April 2016. ^ "2013 Clinton Global Citizen Awards". wbur. 27 September 2013. Archived from the original on 27 September 2013. Retrieved 26 September 2013. ^ Becker, Deborah and Lynn Jolicoeur (27 September 2013). "Malala, Pakistani Teen Shot By Taliban, Honored at Harvard". wbur. Archived from the original on 28 September 2013. Retrieved 27 September 2013. ^ "The 9th Annual Reflections of Hope Award Ceremony". The Oklahoma City National Memorial & Museum. Archived from the original on 15 October 2014. Retrieved 11 October 2014. ^ "Honorary degree for Malala Yousafzai". The University of Edinburgh. 4 November 2013. Archived from the original on 23 October 2013. ^ Rod McPhee (6 October 2013). "David Beckham awards Malala Yousafzai the Pride of Britain Teenager of Courage award after being shot by Taliban – Mirror Online". Daily Mirror. Archived from the original on 11 July 2016. ^ Nast, Condé. "Malala Yousafzai is a 2013 Glamour Woman of the Year; Join Us as we Support Her Mission to Make School a Basic Right For Every Girl". Glamour. Archived from the original on 5 December 2017. ^ "Malala topped Power List 101 at GG2 Leadership awards". Archived from the original on 15 October 2014. Retrieved 10 October 2014. ^ "Mexico says will award Malala with equality prize". 25 November 2013. Archived from the original on 15 October 2014. Retrieved 14 October 2014. ^ "Malala Yousafzai nominated for Children's Nobel Prize 2014". news.biharprabha.com. Indo-Asian News Service. Archived from the original on 19 October 2014. Retrieved 8 February 2014. ^ "PSEU Ireland" (PDF). pseu.ie. March 2014. Archived from the original (PDF) on 13 December 2014. Retrieved 12 December 2014. ^ "Skoll World Forum". Skoll World Forum. Archived from the original on 12 October 2014. Retrieved 10 October 2014. ^ "Malala Yousafzai Canada Scholarship announced". University of King's College. Archived from the original on 19 June 2016. Retrieved 23 July 2014. ^ Bond, Michaelle (1 July 2014). "Liberty Medal for Pakistani education activist Malala Yousafzai". Philadelphia Daily News. Archived from the original on 29 March 2016. Retrieved 22 October 2014. ^ "The 25 Most Influential Teens of 2014". Time. 13 October 2014. Archived from the original on 3 January 2015. Retrieved 30 October 2014. ^ "Malala Yousafzai has become an honorary Canadian citizen". The Star. 12 April 2017. Archived from the original on 13 April 2017. Retrieved 13 April 2017. ^ "(316201) Malala = 2007 EJ98 = 2010 ML48". Minor Planet Center. Retrieved 3 April 2015. ^ "The Results Are In". 11 March 2016. Archived from the original on 14 March 2016. Retrieved 14 March 2016. ^ "Order of Smile award for Poland's Błaszczykowski". Radio Poland. 3 November 2016. Retrieved 31 December 2018. ^ "Order of Smile for Malala Yousafzai". Radio Poland. 6 November 2016. Retrieved 31 December 2018. ^ "Malala Yousafzai made youngest UN Messenger of Peace". BBC News. 11 April 2017. Archived from the original on 11 April 2017. Retrieved 11 April 2017. ^ "The University honours Malala Yousafzai". 12 April 2017. Archived from the original on 13 April 2017. Retrieved 13 April 2017. ^ "Ellis Island International Medal of Honor". 13 May 2017. Archived from the original on 25 October 2017. Retrieved 14 May 2017. ^ Sangillo, Gregg. "Wonk of the Year: Malala Yousafzai is the 2017 Honoree". Archived from the original on 26 September 2017. Retrieved 26 September 2017. ^ "Introducing the Bazaar 150 Visionary Women list". Harper's BAZAAR. 15 November 2017. Archived from the original on 17 November 2017. Retrieved 20 November 2017. ^ "Malala among UK's 150 most influential women". The Express Tribune. 17 November 2017. Archived from the original on 24 November 2017. Retrieved 20 November 2017. ^ "Malala girl who stood up to the Taliban coming to the Dunk on Thursday – Providence Journal". Providence Journal. 23 July 2016. Archived from the original on 18 January 2018. Retrieved 16 January 2018. ^ "Formats and Editions of I am Malala" Archived 3 February 2016 at the Wayback Machine WorldCat. Retrieved 11 April 2014. ^ Fatima Bhutto (30 October 2013). "I Am Malala by Malala Yousafzai – review". The Guardian. Archived from the original on 10 November 2013. Retrieved 10 November 2013. ^ Tina Jordan (21 October 2013). "I am Malala". Entertainment Weekly. Archived from the original on 10 November 2013. Retrieved 10 November 2013. ^ Robbins, Sarah J. (12 October 2017). "Four Questions with Malala Yousafzai". Publishers Weekly. Archived from the original on 20 November 2017. Retrieved 13 December 2017. ^ "15 films in the Documentary Feature category will advance in the voting process for the 88th Academy Awards". Natalie Kojen. Oscar.org. 1 December 2015. Archived from the original on 1 December 2015. Retrieved 2 December 2015. ^ Tyagi, Amit (2 September 2017). "TV actress Reem Sheikh to play Malala Yousafzai in a biopic called Gul Makai". India Today. Archived from the original on 6 September 2017. Retrieved 15 September 2017. ^ Malala's Magic Pencil. Archived from the original on 31 October 2017. ^ Cowdrey, Katherine (12 March 2018). "Malala signs We Are Displaced with W&N". The Bookseller. Archived from the original on 13 March 2018. Retrieved 13 March 2018. ^ Carter, Imogen (10 October 2017). "Malala's Magic Pencil by Malala Yousafzai review – an enchantingly light touch". The Guardian. Archived from the original on 25 October 2017. Retrieved 25 October 2017. ^ Gurney, Rebecca (23 October 2017). "Illustrating a better world: 'Malala's Magic Pencil' inspires, invokes youth voices". The Daily Californian. Archived from the original on 25 October 2017. Retrieved 25 October 2017. ^ a b c Wilson, Kristian (12 March 2018). "Malala Yousafzai's New Book 'We Are Displaced' Will Tell The True Stories Of Refugees She's Met". Bustle. Archived from the original on 14 March 2018. Retrieved 13 March 2018. ^ Canfield, David (12 March 2018). "Malala Yousafzai is writing about refugees for her next book". Entertainment Weekly. Archived from the original on 12 March 2018. Retrieved 13 March 2018. ^ "What is Malala Yousafzai up to now?". The Week UK. Retrieved 18 February 2019. ^ Cowdrey, Katherine (13 March 2018). "Malala leads Hachette showcase 2018". The Bookseller. Archived from the original on 14 March 2018. Retrieved 13 March 2018. ^ Power, Julie (13 December 2018). "'Your job as a human is to welcome them': Malala's disappointment at Australia". The Sydney Morning Herald. Retrieved 28 December 2018. ^ "We Are Displaced by Malala Yousafzai". Little, Brown and Company. Retrieved 11 March 2019. ^ "We Are Displaced by Malala Yousafzai". Orion Publishing Group. Retrieved 11 March 2019. Wikimedia Commons has media related to Malala Yousafzai. "Malala Yousafzai collected news and commentary". The Guardian. "Malala Yousafzai collected news and commentary". The New York Times.